Wouldn’t life be easier if you could just solve all of your problems with lightning bolts? Rush hour traffic in your way? Just shoot a lightning bolt at those cars. House centipede crawling around in the basement? Hit it with a lightning bolt. Your phone ran out of juice? Give it a good zap with your lightning bolt. Microwave on the fritz? Just blast your frozen dinner with a lightning bolt! That’s how Zeus lives, every single day. He’s the head honcho of the pantheon of Greek gods. He doesn’t need to mess around with any half-measures and pointless dialogue to solve all of life's troubles. He just shoots a darn lightning bolt at them and all of his problems go away. What a life! Us mere mortals need to live a much more complicated life, but perhaps you can get a small taste of what it’s like to be Zeus by wearing this exclusive costume. 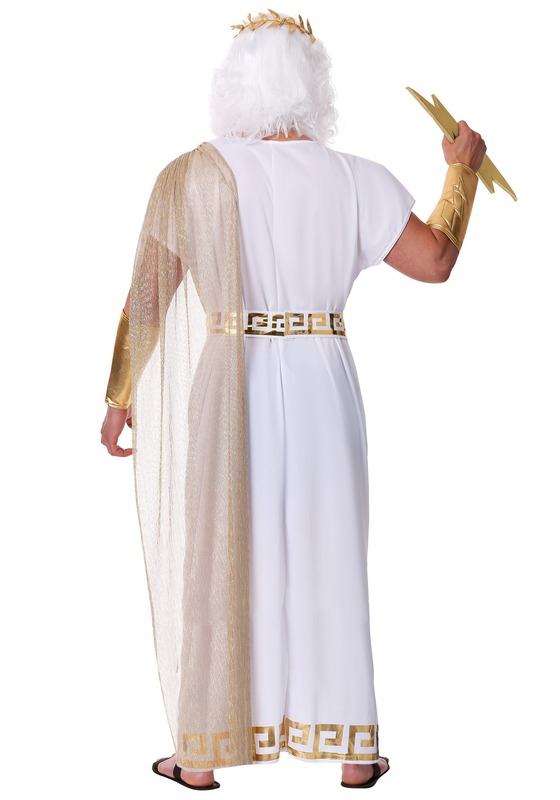 Based on the mighty Greek god, this men’s Zeus costume makes you look like an all-powerful deity. The white tunic top is reminiscent of the garb worn by ancient Greeks. It even has gold accents along the bottom for a truly regal look. The belt has gold designs on it and matches the gold accents on the tunic. The drape is a shimmering gold color and can be tucked into the belt. A pair of gold gauntlets fit around the wrists, but the true coup de grace of this outfit is the crown, which will sit atop your head to make you feel like the king of all Greek gods! 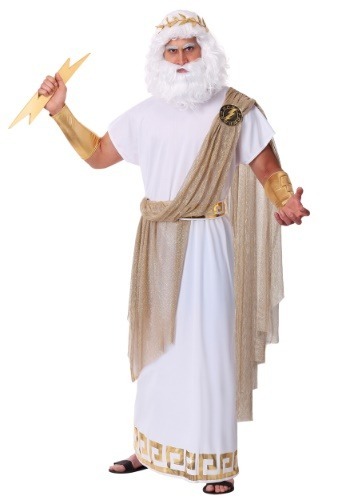 This Zeus costume won’t actually give you the power to shoot lightning bolts at your problems. It will, however, help you feel like one mighty being. Just make sure you behave while wearing this outfit. Queen Hera will have her eye on you! Her wrath is one problem that even Zeus' lightning bolts can't solve.